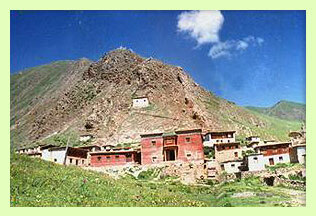 is located in the eastern region of Tibet known as Kham and near the town of Zhaskar. It was established approximately in the year 1650, during the time of the 10th Gyalwa Karmapa and the 5th Dalai Lama. The monastery was founded and built by Ju Lama Songhak Tenzin who was a descendant of the Mongolian king,known to the Tibetan's as Ju Amnye Parchen Yeshé. was a descendant of Ju Lama Songhak Tenzin. As the responsibility for the gompa was passed through the descendants of Ju Lama Songhak Tenzin, this is how it originally came under the protection of the first Mipham Rinpoche. The tradition was that the monks in this family were responsible for the Gompa and the laymen took up positions as governmental ministers. At the time of the death of the first incarnation of Jamgong Mipham Rinpoche, a male family member took over the responsibility for the monastery, and a search was made to find the second incarnation. The second incarnation of Jamgong Mipham Rinpoche, whose name was Derge Lhasay Mipham Saywang Dhundur, was the 15th King of Derge (a tibetan kingdom within Kham). He had many responsibilities for his kingdom and was unable to become a monk or live in Junyung Gompa. However this did not prevent him from taking on the responsibilites for the gompa in a general sense. The daily management of the gompa remained within the Ju family. After the death of the second incarnation again a search was made by the monks of the gompa to find the new incarnation of Jamgong Mipham Rinpoche. Once he was found and identified, he was brought to the Junyung Gompa, where he was enthroned and invited to live at the monastery. The 3rd incarnation of Jamgong Mipham Rinpoche is also related to a branch of the Ju family through his mother, although not the Jutsamg family directly. During the time of the Mongolian invasion of this region, the great translator Mee Ling Lochen, who helped to bring the Buddha dharma to Tibet, was killed. At this time all of the gompa's were destroyed. After this destruction the son of Mee Ling Terchen, Trinley Namgyal came to Kham seeking refuge and safety. He was a recognized emanation of Jetzin Jambayang Manjushri and a quite famous lama in Tibet. He was also the brother of Mee Ling Lochen, the translator. Trinley Namgyal stayed for a few days in a small house on the hillside above the monastery. This house still stands within the monastery compound. At the time of Trinley Namgyal's visit the gompa was already long established. This small house was used for the retreats of both, the first and the third incarnations of Jamgong Mipham Rinpoche.